(Sorrowful thanks to: H.A., F.M, D.N.S) We have confirmed that Archbishop Chrysostomos of the TOC of Greece reposed today (September 6/19) at the age of 90. We have taken the following biography from the Euphrosynos Cafe. The Archbishop of the Genuine Orthodox Church of Athens and of all Greece, His Eminence, Chrysostomos II (whose secular name is Athanassios Kioussis, born to Konstantine and Syrmo) was born on October 8, 1920 at Erythres of Megara (also known as Kriekouki) where he grew up as a young boy. Later on he lived with his parents in the city of Lavrio. While a student, he would frequent around many churches and monasteries and, ultimately, grow fond of Byzantine music. Quite frequently, during the great holidays of the Orthodox calendar, he would travel from Lavrio to Erythres in order to chant at his village’s church where the Orthodox Traditionalists would congregate and conduct the Divine services (at times, without even the presence of a priest, for they were small in number in comparison to the needs of the parishes). He completed his secondary education at the age of 17. Fulfilling his father’s wish, he, then, sat for the examinations at the Military Academy where he would embark on a career in the military. However, he was inflicted by pleuritis which later transformed into a lighter form of tuberculosis. This became the reason for him to follow his own dream instead of his father’s and take the road towards monasticism. He spent the remaining time recuperating and studying on his own at his own home which coincided with the Greco-Albanian war as well as the German occupation of Greece which were in full effect. Right after the liberation of Greece, he was tonsured into the male Holy monastery of the Evangelist of Athikion at Corinth under the abbacy of the current, at the time, Archimandrite Kallistos Makris, who later became the Metropolitan of Corinth. During the civil war, the monastery was caught in between the adversaries combat fires, and he was miraculously saved from death. He was ordained a priest in 1947 by the Bishop of the Cyclades, Germanos, and due to his infirmary he briefly led a private life while servicing for a couple of years the Faithful of Erythrai and Villia. Wearing the great schema, he was tonsured into the Great Schema at the Holy Monastery of Kosmosotiros (World-Savior) in 1948 by the ever-memorable Gerontas Theokletos Darademas. During the years 1951-1953 the persecution of the True Orthodox Christians by the new-calenderist Archbishop Spyridon Vlachos broke out. Our hierarchs were exiled. The churches were shut down and our priests were captured and defrocked while expelled and scorned by the police authorities. 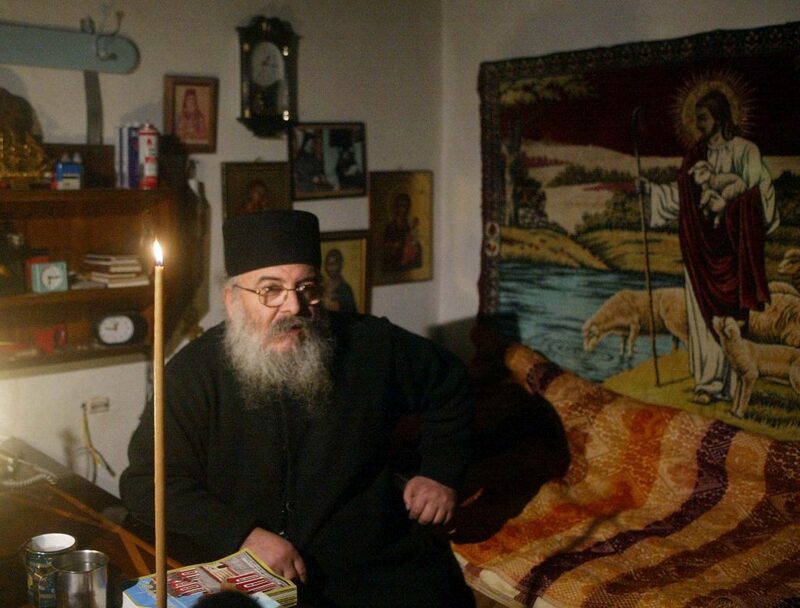 On the eve of the Holy Annunciation, the ever-memorable Bishop of the Cyclades, Germanos, passed away. Spyridon Vlachos forbade his ecclesiastic burial and deeming him an unworthy successor of Caiaphas, he ordered that the corpse of the deceased be guarded at the Saint Helen clinic (where he was transferred from jail while breathing his last) as to deter the prospect of conducting a burial service by a True Orthodox priest. However, God had arranged otherwise. During the same period, then Archimandrite (now Archbishop) Chrysostomos Kioussis, was secretly hiding as to avoid being captured and defrocked by police authorities, by conducting liturgies in country chapels or in the apartments of faithful Christians who had transformed them into catacombes and by moving around only during the night and with great caution. In 1951, in one of those catacombes, he conducted a Vigil to the Annunciation of the Theotokos along with the ever-memorable Archmandrite Petros Astyfides (later, Bishop of Astoria, USA) both being deeply grieved by the news of the passing of the Ever-memorable Bishop Germanos. A white cloth with paper icons pinned on it would separate the Holy Altar from the rest of the room. Two tables would assume the role of the Altar Table and the Prothesis. They conducted the liturgy in this manner when suddenly (at 2 am) there was a knocking on the door! Fortunately, it wasn’t the police. They were members of the Youth branch of the Genuine Orthodox Church who were seeking a priest to secretly conduct a burial ceremony since they had already convinced the guard of the deceased to “shut his eyes.” Archimandrite Petros continued the Vigil while Archimandrite Chrysostomos went to the funeral of the monk-priest. While the funeral was reaching its end, the police guard who was faithfully participating, warned that the time had come for him to be relieved. Indeed, while the priest and his entourage were heading for their car, he was noticed by the oncoming police guards. Thus a police pursuit broke out. However, Pericles, who was the priest’s experienced driver, drove through the intricate streets of Athens and managed to escape and, thus, keep Archimandrite Chrysostomos from being captured and defrocked. In 1956, he assumed the responsibilities of the General Secretary of the Church Committee which had taken over the leadership of our Church after the passing of the ever-memorable Chrysostomos (former Archbishop of Florina) in which he partook. 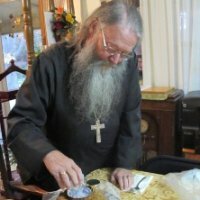 With the authorization of the Church Committee he traveled by train to Germany and France along with the monk-priest Akakios Pappas (current Metropolitan of Attica and Diavleia) in order to come to an agreement with the Bishops of the Russian Diaspora, Alexander and Ioannis (Maximovich), with the goal of consecrating Bishops for the Genuine Orthodox Church of Greece from the Russians but without ever accomplishing that goal, for they were referred to the Metropolitan of the Russian Diaspora in America, Anastasios. Initially, from the entire clergy body (namely 105 clergymen), he was voted to the Episcopal rank along with his co-presbyters Akakios Pappas and Chrysostomos Naslimis. He worked diligently until the agreement with the Russian Diaspora in America regarding the consecration of both the Ever-memorable Gerontas Akakios Pappas and the remaining ordained archpriests was achieved. After that, he spent his private time at the Holy Monastery of the Panachrandou at Megara, which he himself founded, during which he would occasionally offer his services at the church as a secretary.
. In 1971, he was consecrated the Metropolitan of Thessalonika while, simultaneously, undertaking the pastorship of Eastern Macedonia and Thrace and working hard with all his might on the organization of his Diocese until 1986 when he was elected the Archbishop of Athens and all Greece – a position which he still holds until this very date while presiding over the twelve member Holy Synod of the True Orthodox Church. During his pastorship, he succeeded in the cleansing of his clergy from foreign and imported elements which had found their way in the struggle of the True Orthodox Church and, thus, renewed the clergy body with new bishop consecration during the years 1998, 1999 and 2000. 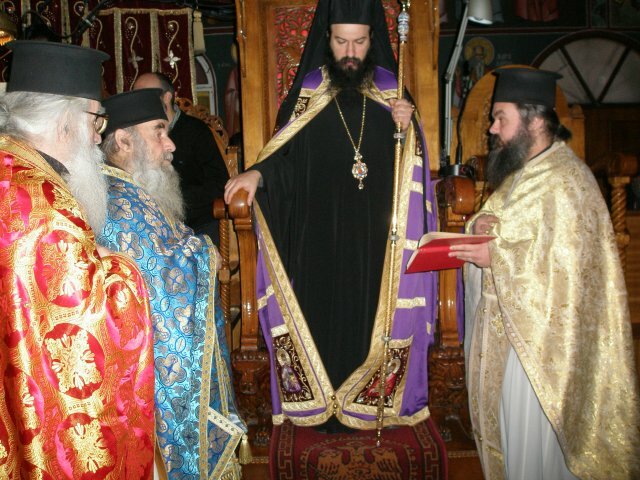 Archbishop Chrysostomos II is the first Archbishop of the G.O.C. who ever became acceptable from the maximum sovereign of our Country (the President of the Democracy Mr. Constantinos Stefanopoulos on 8-6-1998). The name day of His Eminence the Archbishop of Athens kyr Chrysostomos is November 13 – the Feast of Saint John, the Chrysostomos (November 26 according to the New Calendar).